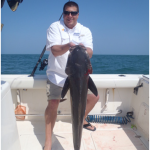 My first Cobia! 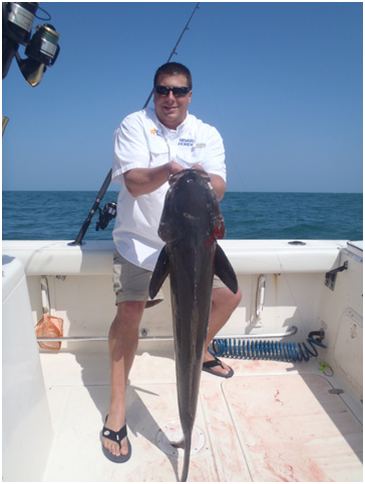 And a respectable 42lbs is a great fish to provide a memorable battle. These fish aren’t the most attractive fish swimming in the ocean but they can’t all be Blue Fin Tuna! 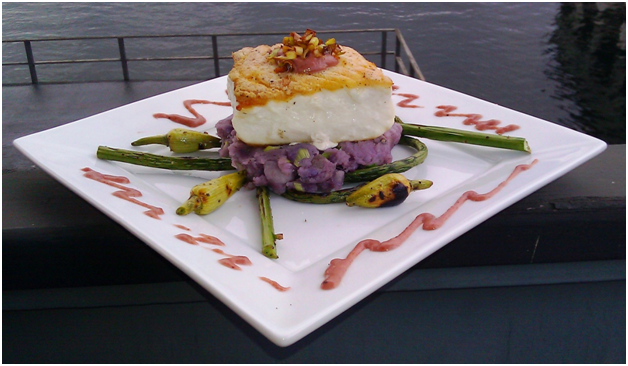 Here is a dish I put together using some of the Halibut I caught this spring off Port Townsend. Halibut is a challenging fish for me personally, it’s delicate flavor can be overpowered easily and overcooking is always a concern. With the help of the produce manager at my local PCC, I came up with this dish. Grilled Garlic Scapes – super easy; olive oil, salt and pepper then grill for 3-4 minutes over medium high heat. 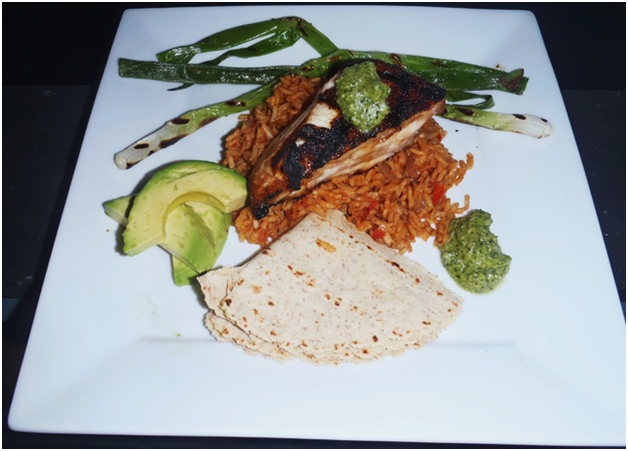 These were delicious and fun to plate…. Very similar to grilled asparagus with a roasted garlic taste. Smashed baby purple potatoes – boiled till fork tender, smashed with a fork and seasoned with butter, salt, pepper, sliced scallions, parmesan cheese and finished with a drizzle of truffle oil. Pan seared halibut – start with the best, Halibut from Port Townsend. I dusted one side with seasoned rice flower and shook off the excess. In a high quality pan, I fried the whites of leeks in olive oil till golden brown, removed the leeks and used the flavored olive oil to sear the halibut. Once the halibut is crusted, flip and finish in a 325 oven. Rhubarb, leek and black cherry juice reduction – in a heavy sauce pan, sauté sliced rhubarb and leeks in olive oil with kosher salt and fresh cracked pepper. Once tender, deglaze the pan with black cherry juice and reduce. Finish with fresh grated ginger, lemon zest and honey. Let cool and run through a food processor for the desired consistency. Have you ever wondered what makes “California” so special that they get their name on so many dishes? They have their own pizzas, omelets, sushi rolls, and salads to just name a few. Well here is my take on a California B.L.T. that decided to move north; The Northwest B.L.T. with baked, Sweet Potato fries. The inspiration for this great sandwich came to me after I received some vine ripened tomatoes and basil from a friend’s garden. 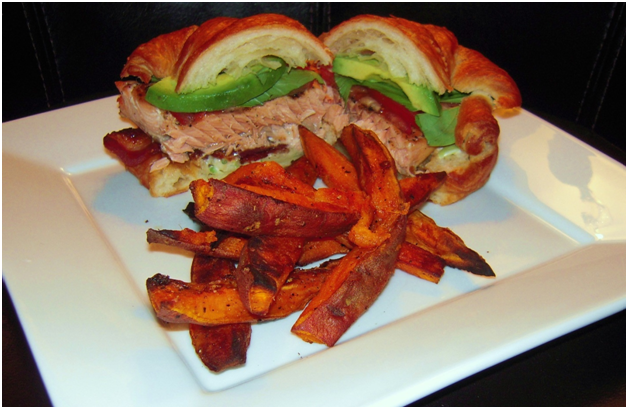 All I had to do is add a fillet of Coho salmon, some garlic and green onion aioli, crisp bacon, an avocado and put it all together on a fresh croissant. For the sweet potato fries, heat up a baking stone in a 425 degree oven. Cut up the potatoes and season with olive oil, salt and pepper; bake until crisp.